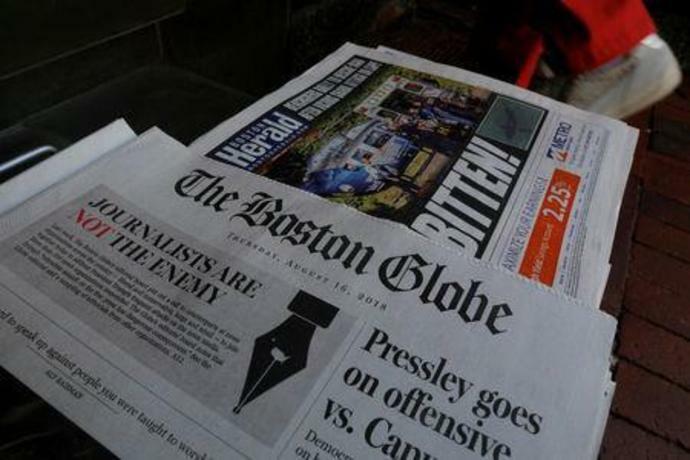 BOSTON (Reuters) - U.S. investigators are probing whether a man accused of threatening to kill journalists at the Boston Globe after calling them "the enemy of the people" made similar threats to the New York Times and National Football League, a prosecutor said on Monday. Robert Chain, 68, pleaded not guilty in Boston federal court to charges that he threatened Globe employees in August after the paper coordinated an editorial response by more than 350 newspapers to President Donald Trump's attacks on the media. "We are investigating a number of calls made to other organizations, including the New York Times and the NFL," he said. Trump has frequently criticized journalists and labeled news reports that he objects to "fake news." He has called news organizations the "enemy of the people," and has regularly attacked the Times. Noting that 19 firearms were found in Chain's home in California after his Aug. 31 arrest, Varghese asked a federal magistrate judge to require Chain to wear an electronic monitoring ankle bracelet to ensure he does not approach those organizations. William Weinreb, Chain's lawyer, did not object to that condition. But he noted that Chain had not violated any of his bail terms and that the guns that the government seized were lawfully owned. On Aug. 16, the day the editorials ran, Chain called the Globe's newsroom and threatened to shoot employees in the head at 4 p.m, prosecutors said. The threat prompted authorities to station police outside the paper's Boston building.